Barcelona have taken the lead vs Rayo Vallecano in the 51st minute of their La Liga clash, Lionel Messi stayed cool, calm and collected to give the Blaugrana the lead from the penalty spot. 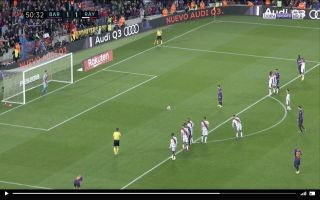 Barca were awarded the penalty after right-back Nelson Semedo was hacked down in the box, Messi stepped up to the spot and fired Ernesto Valverde’s side into the lead. Messi looked as cool as a cucumber as he sent Vallecano’s keeper the wrong way by rolling the ball into the bottom corner. Calm as you like ? Barcelona will have a seven point lead at the top of La Liga, should they be able to hold on to their lead tonight.